A rich source of gold is in your sock drawer or around the house. It comes in the form of end-of-life electronic devices that are being generated in escalating numbers each and every year. Electronics recycling is critical in diverting solid waste and supporting zero landfill initiatives. Also highly significant, electronics recycling helps eliminate toxic scrap. While it constitutes a minority of solid waste, it represents up to 70 percent of toxic waste. In the U.S., approximately 4.4 million tons of end-of-life and used electronic products are recycled annually. It provides a much richer resource than the extraction of virgin material. In fact, ISRI states that as much gold can be extracted from one metric ton of old computers as can be generated from 17 tons of ore. This e-waste is a particularly rich source of precious metals – with concentrations 40 to 50 times more abundant than naturally occurring deposits. There are over 320 tons of gold and greater than 7,500 tons of silver used each year to make new electronic products around the world. As a result, there are more than $21 billion in precious metals inventoried in these devices - $16 billion worth of gold and $5 billion worth of silver, until a time when they can be recycled. The carbon footprint of both metals and plastics recovered through recycling is much smaller than for the production of the same materials from virgin sources. The recovery of these precious metals is no small issue. While a modern recycling facility can recover as much as 95 percent of gold, in developing countries, the crude dismantling processes employed may recover only 50 percent of this precious metal. Overall, current recovery rates of e-waste for processing is quite small. For example, for 2009 the U.S. EPA reported that only eight percent of cell phones were recycled, along with 17 percent of televisions, and 38 percent of computers. 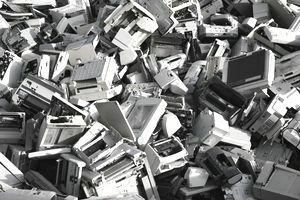 Not enough of overall devices find their way to recyclers, and for the ones that do, not enough metals are recovered from those devices, on a global scale. Recycling results in only a 10 to 15 percent recovery of all the gold stored in e-waste. The rest is lost. Promoting investment in best practices to ensure that recovery will be maximized in both developed and developing countries. The recycling process varies among jurisdictions. The processing of e-scrap involves primary and secondary steps. In the primary phase, electronic devices are dismantled or demanufactured, and the components sorted. Further processing then takes place, often at secondary recycling facilities. This can involve a variety of processes to crush and sort material through the use of magnets, screens, and eddy current. A smelting process is utilized to liberate precious metals from electronics components. One promising new process promises to more quickly and inexpensively recover gold from old computers and other electronic devices, with less environmental impact. Their process makes use of a solution -- acetic acid combined with very small amounts of an oxidant and another acid, which researchers say dissolves gold at the fastest rate ever known. Also of note, Apple reported in April 2016 that it had recovered 2,204 lbs of gold in the previous year, valued at $40 million. In the future, the waste stream of today will increasingly be recognized as a material recovery opportunity, a necessary outcome as we strive towards ​sustainability.